The new Hemnet - version 2.0 or 1.4? In the web industry the use of term '2.0' comes with a large responsibility. There has to be a significant update. 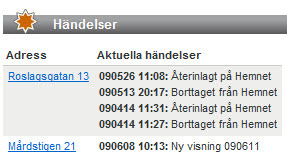 Therefore, I was a bit disappointed today when the indeed anticipated 'Hemnet 2.0' version was launched. 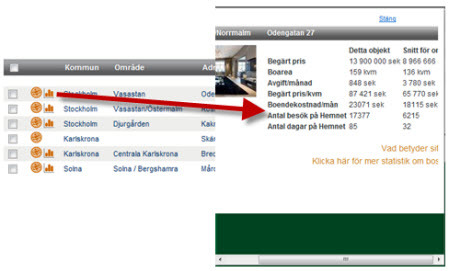 (Hemnet is the largest residential search engine in Sweden, more here.) I was expecting more. (So did 100s of people on Twitter.) Anyway, let us go through the new version. In the earlier version the search was divided into three different pages. In the new version it's done direct on the starting page. An improvement is that the search parameter 'size of land' has been added. 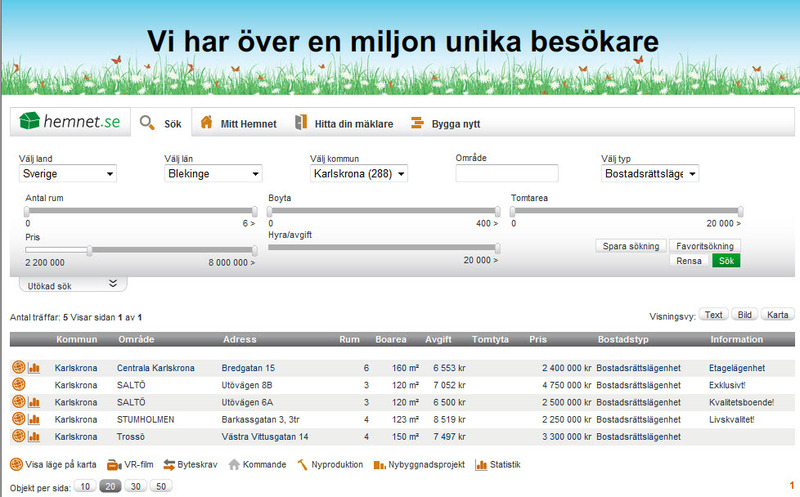 The biggest improvement has been done to the functionalities in the account area 'My Hemnet'. You're now able to easier create 'default' searches, save listings of interest, get updates through RSS and see changes done to a listing. One thing the new services on the market (like Booli and Boliga) has forced Hemnet to do is to be much more transparent about data like number of days on the market. Over the last weeks this data has been added to Hemnet and this continues. 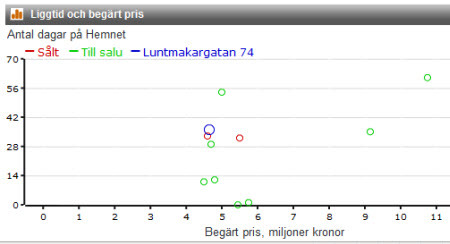 The graph below displays a specific listing (in blue) in comparison with sold (red) and listings (green) regarding number of days on the market (Y-axis) and asked price in million SEK (X-axis). You're also able to see the price for listings in the area that has been sold. However, the biggest disappointment is that Hemnet is not able to make an overall better solution. The possibilities are endless with their position and all their data. A great initiative to make improvements, but in my book it isn't a version 2.0. Is found here (all in Swedish): 1 (article at IDG), 2 (OhSoHighTech), 3 (MKSE), 4 (Norén), 5 (Bostadsknarkaren) and finally the press release 6. Older PostA debate on Swedish search engines... on Twitter!